Phuket Mermaids is a Swimsuit, Lingerie and Swimwear line that is revitalizing and revolutionizing the entire swimsuit industry. This High Quality & Fashionable Swimwear offers delicate Fabrics with Detailed Prints & Designs, Exquisite Sequenced Embroideries and Heavenly Comfort & Modern Styles for all Shapes & Sizes. When Mark Gingpayom of Phuket Mermaids was looking into a cost effective way of both relocating and opening up additional outlets in Phuket he contacted MY STORAGE. “Finding a safe and convenient way of storing our stock in Phuket makes the logistic of our business very easy. MY STORAGE has friendly staff, easy access and is well located. The service is cost saving in our expansion and helps us minimize delays during moves and restorations". Comments from Khun M of Make Up Store.
" We opened our new Make Up Store at Jungceylon Shopping Center, Patong in 2010 and needed prior to opening secure storage for our products. Once operational we kept our storage unit at MY STORAGE, it is an ideal place to keep our stock and promotional materials". Stefano Righi, National distributor of Radiosa Natural Mineral & Sparkling quality water. "Large orders for Phuket are delivered directly from our facility in Bangkok. All local orders from our rented space at MY STORAGE. Advantages for us is the central location for our customer base, good parking for loading and unloading, the pricing, cleanliness and wide choice of unit sizes". Stuart and Alex introduced "Rollerball" to Phuket, 160 metres of rolling pleasure at Kalim Beach, Patong. "Prior to start of our operation we use MY STORAGE for our imported equipment. We store at MY STORAGE since there really are no other alternatives. 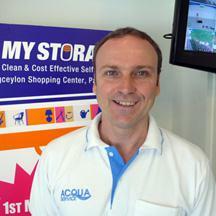 The staff is very supportive, clean storage units, cost is fine and it feels safe with the western management".